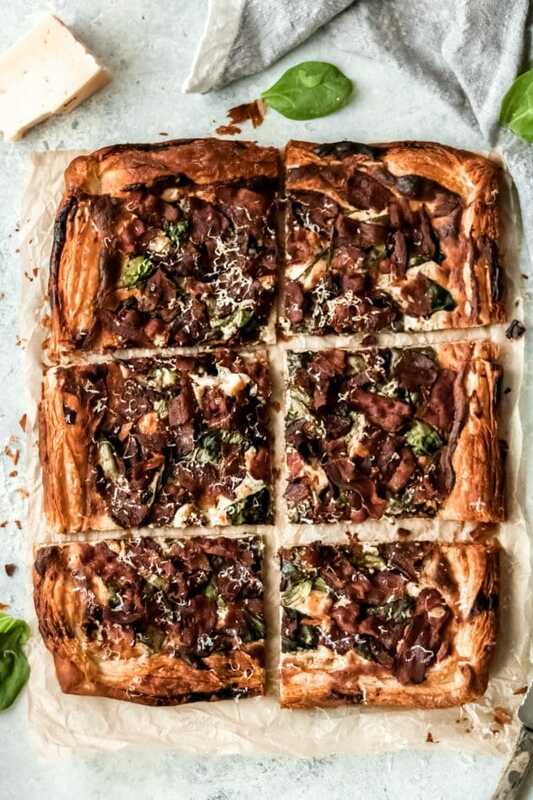 This savory bacon asiago pastry tart has a golden flaky crust with a sweet and savory filling, the perfect item to add to your next brunch. Where are my brunch fans?? I love brunch because it’s like the best of both worlds. You get sweet and savory foods, all in one sitting. 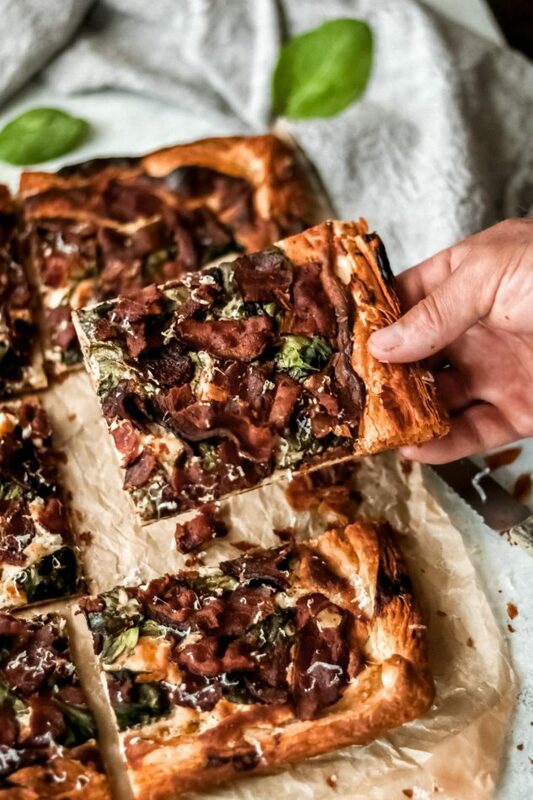 If you’re into brunch, you’ll want to add this savory bacon asiago pastry tart to your menu. Or, just enjoy it on a slow weekend morning, whichever you prefer! Its golden flaky crust is a bread lovers dream, and the savory filling has just a tiny hint of sweet to it, giving you that sweet + savory combo. 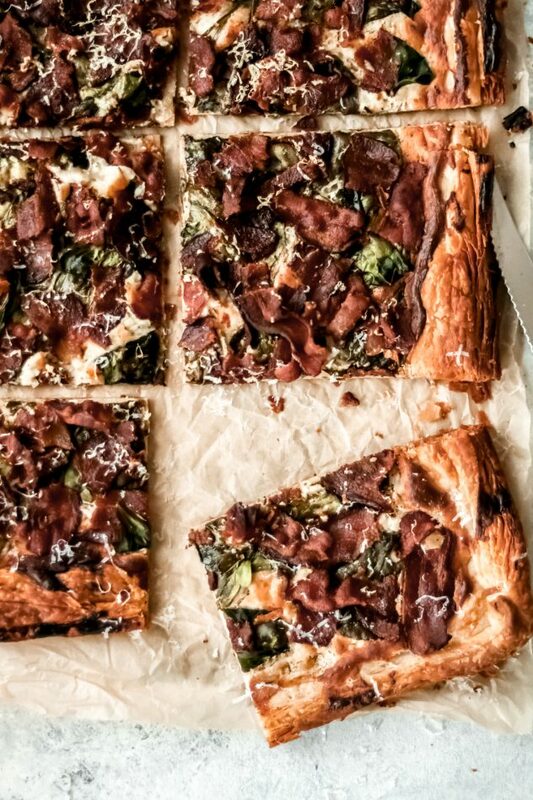 Of course, bacon is the start of the show in this savory breakfast tart. The filling is topped with all the bacon your bacon-loving heart could ever want! 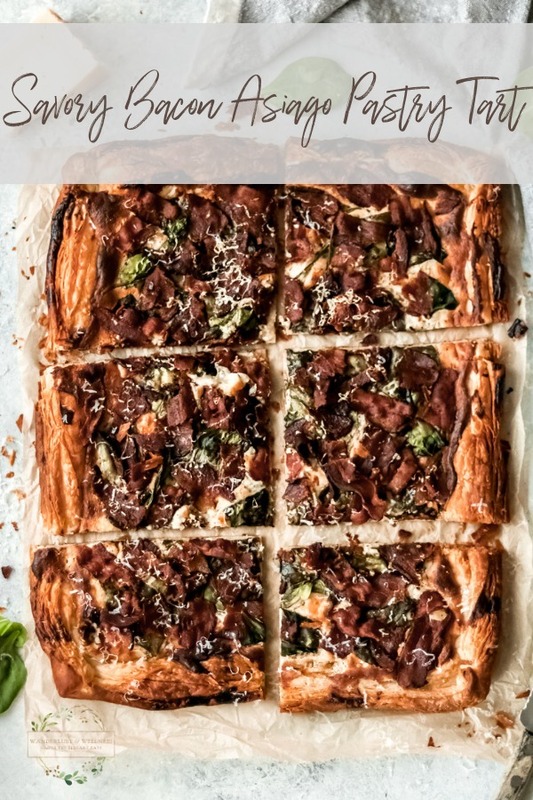 Underneath the bacon is fresh spinach, and underneath that is the savory asiago filling made with cream cheese, asiago cheese, thyme, and a hint of maple syrup. Bake for 20-25 minutes and then enjoy! If you’re feeding a large crowd you can definitely cut the pastry tart into smaller pieces. Baking time on this pastry tart is going to be 25-30 minutes. I like my pastry tart almost overcooked, so it’s super crispy and flaky, but you like yours not so flaky you can reduce the cooking time down just a bit. I would start checking it at the 25-minute mark and watch it from there, regardless of the package directions. 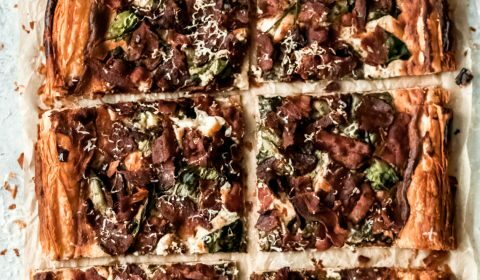 You could also get super creative and add in additional toppings like kale instead of spinach, or caramelized onions. As with all of my recipes, I encourage you to get creative in the kitchen and make it your own if your taste buds desire! Cook the bacon. Transfer to a paper towel-lined plate to cool. Once cooled, crumble into small pieces. While the bacon is cooking, combine the cream cheese, asiago cheese, thyme, salt, pepper, and maple syrup in a large mixing bowl and stir until well combined. Grease a large flat baking sheet, then roll out the puff pastry dough onto the baking sheet. Using your hands, spread the puff pastry dough out until you have a large rectangle about 9 x 13 inches. Next, using your fingers fold over the edges of the puff pastry all the way around, about 1/4 of an inch, to make a crust edge. Spread the cheese filling over the entire bottom of the puff pastry dough up to the folded edges. Next, top with fresh baby spinach, then top with the bacon pieces. Bake for 25-30 minutes or until risen and golden brown. Remove from oven, let cool, then cut and serve. Top with additional grated asiago cheese if preferred.